Portable air compressors air-up tires quickly and easily. An air source that is always available on- and off-road. Smittybilt 's new air compressors from Summit Racing allow you to air-down tires to improve stability and traction for the terrain you’re in. At the end of the day, air-up without having to drive on the street with underinflated tires. The powerful units have an oil-less direct drive motor and can be permanently mounted and hard-wired so an air source is always available on- and off-road. 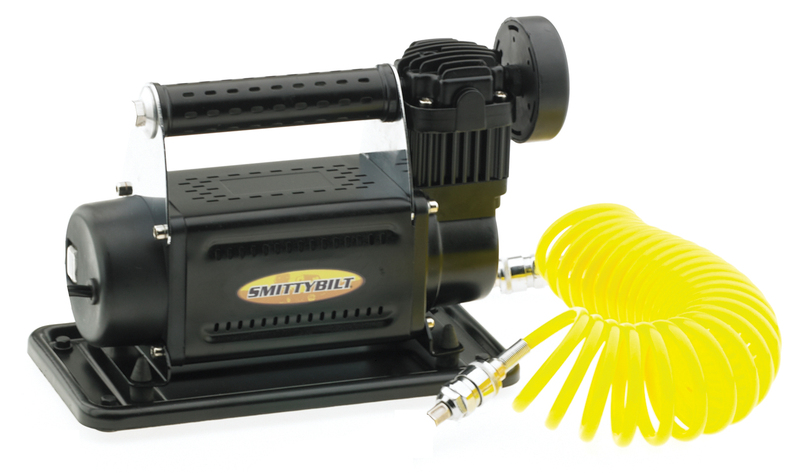 Features include a screw-on brass inflator top, quick-release coil hose, anti-vibration feet, an automatic thermal cutoff switch to protect the motor against overheating, a cleanable air filter and storage bag. Summit Racing offers four models of Smittybilt compressors: 5.65 cfm @ 45 amps/150 psi, 2.54 cfm @ 30 amps/150 psi (vehicle mount and portable), and 3.17 cfm @ 45 amps/150 psi.